It was Birraa season in Oromiyaa. It all happened in Maa’ikalaawii (Central) Investigation center in Northern Finfinnee. One morning hour, some prisoners were busting in the morning sunshine behind a building where prisoners meet their relative by appointment. The north side of the building had window like openings, where family handover lunch to police every morning to be given for their loved ones. The late comrade, Isheetuu Ulatuu, was permanently assigned to receive food, closing and other materials family members bring for prisoners. Prisoners that take the food from Isheetuu and deliver it to prison cells were busy going in and out of the Upper Compound. Jaal Beekaa (Gazaahiny Kaasaahun Jaarraa) was one of the deliverers. At a certain point he told this writer that many prisoners had been brought from Karcheellee. Everyone thought it was for release. It was also said Karcheellee Prisoners were seen going in and coming out from the prisoners’ administration office one by one with piece of paper in their hands smiling. Then Jaal Beekaa came again and told him that prisoners from lower compound including our comrades Lieutenant Yiggazuu,who is a graduate of Military academy and Kabbada who worked for Ministry of agriculture around Adaamaa, were called out. Then this writer saw from distance when Jaal Muhee was called. J/ Muhee were a member of the highest leadership of OLF. Then no sooner Beekaa, who was First Deputy President of Confederation of Ethiopian Labor Union, was called. Now the matter became a puzzle. Those who were busting in the sun were excited and went in to wait for the news if any. After some time the administration asked for their belongings. It now became obvious that something fishy was going on. All prisoners were stunned. What was to be heard and done on October 18, 1986 was the worst of all experiences in prison for Oromo political prisoners.All the mentioned comrades wereslaughtered. In addition there were political prisoners brought from Karchallee, affiliated to EPRP, EPLF, TPLF and Jehovah Witness who had been under detention from 6-9 years that met the same fate as the four Oromo comrades. From Maa’ikalaawii prisoners, out of the eighteen fourOromo nationalists,Muhee Abdoo Abbaa Duulaa, Gazaahiny K. Jaarraa, Kabbada Damissee, and Lieutenant Yiggazuu Waaqee were included. Most Oromo prisoners were imprisoned starting December 1979. They were all never given court hearing, they were also never charged except the sufferings they received in torture rooms. All were strangled to death with ropes on that day in that compound and buried in Kotobeeas late rumors went. This was verified after fall of the Darg by Argentine Forensic Anthropology Team (EAAF). As to how many the numbers of those victims were, was not clearly known then, but it was given after discovery of their bodies as thirty. Coincidentally or planned, on that day for the first time, TV set was brought and prisoners from both compounds were assembled in open space in front of the Upper compound.The Head of Maa’ikalaawii, Colonel Argawu Isheetee came back from butchery and gave a speech unrelated to what he has done before coming there. He started to lecture that prisons are not for punishment but correction. No one forced Argawu to lie about objectives of his institution. The prisoners know that unknown numbers of prisoners were massacred that very day under his watch whoever might have ordered it. Though the goal the martyrs set together with the remaining, establishing Democratic Republic Oromiyaa is not yet achieved, the debate has reached a level never seen before.Fiery, indefatigable Qubee generation has come up to upholding the kaayyoo for which they gave their lives and made their cause known to the world. Their presence could have made a significant difference but damn the enemy, the nation is denied their courage and determination which seem in short supply these days, where swindlers and opportunist are frolicking unabated. Thus Oromo group lost four outstanding comrades on that day, they were never given a hearing or no evidence brought against them publicly. Their remaining 14 comrades can say or do nothing except waiting for their turn dying from inside. The dead were comrades and darlings of the group. They did not live to see the great leap their revolution took as well as the traitorous diversions of many of their comrades. Those spared for that day didn’t know when and in what manner their turn would come but they survived the Darg if not the frustrations. Ten were released by the Darg on September 2, 1989 while the rest were set free in 1991 before the demise of the remaining Darg pretenders. This writer felt that his soul and body were no more together. He was nothing but a living dead. He could not protest vocally or get up and leave the assembly. He was under the spell of the Administrator. After the lecture was over he went back to his cell and covering his body inside his gaabii (toga) sobbed like a child. Was it cowardice or instinct for survival that did not make him burst in public, he still cannot say? Similar feelings are observable among all comrades. They could not open their mouth for many hours even to talk to each other for they were all choked with grieve. Grieve which cannot be expressed without crying and shading tears, crime which snitches were looking for. 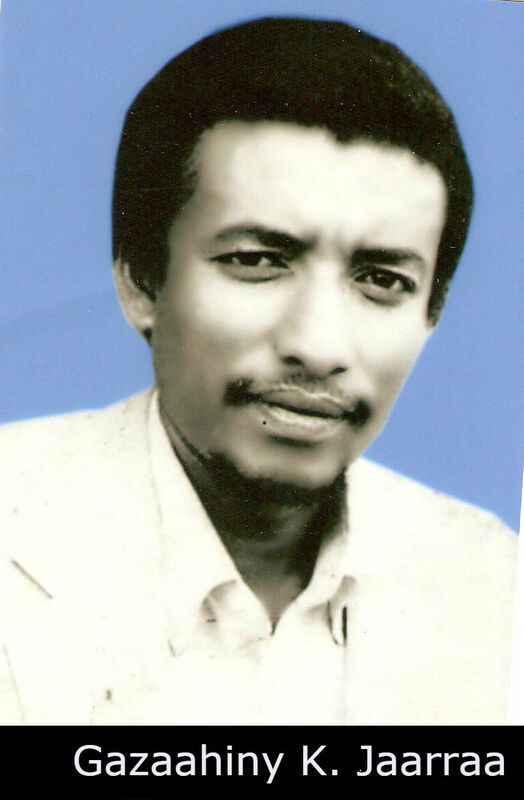 If involvement in the Oromo liberation movement is a crime he was not less if not more criminal than those executed. Why these young ones when the older ones were spared? It was a riddle that he failed to decipher then. But as days passed and he was able to connect certain historical facts he understood that killing youngsters of those they oppress, in order to deny them hope of developing leadership is standing policy of Habashaa rulers. Action taken outside the rule of law has no rational or basis and this writer has no answer for his mental query. But days passing and connecting historical facts he realized that killing the young and energetic is tactics of Habashaa rulers to deny those they dominate the hope of developing leadership. The huge Oromo population, fertility of Oromo mothers and the capacity of Oromo tradition to integrate aliens, is what bothers them from time immemorial. They want to reduce it by all possible means including, extra judicial killings, poisoning, castrating, sterilizing, spreading deceases like AIDS, cholera and the likes and denying the necessities of life like food for the needy.Agaazii’s shooting children on head and heart to kill is part of this. They did not originate such techniques but copied from fascists and admirers of their methods. But each action can boomerang and woe to them when that happens. Leaving aside those before them, if we see their criminal practices and how their recent kings ended up alone, for instance, Yohannis VI, Minilik II, Haayila Sillaasee, Dargand Mallaswill be enough. There are even today those that refuse to learn from the past. Aliens are not interested in the wellbeing of the people but in land and natural resources of Oromiyaa. First they used to say Oromo have no land but born to be their serfs. When that refused to hold water they started to say we have formed blood ties through breeding.That also doesn’t make them different from other peoples of the world. Then they started wooing Oromo runaways to help them in reoccupying. Such are self-serving Oromo though pretending to care for the people. Just not to yield to own national peer, they throw life line to national enemy that history rejected. Those are the types that don’t feel comfortable without alien master. However, Oromo youth are aware that their life cannot be spared and they cannot leada peaceful and stabile life unless they totally get off the oppressor from their back. Not only those that are Oromo but even those that take residence in Oromiyaa are obliged to defend Oromiyaa from aggressor coming from outside her. Be it to put own people’s history, culture and tradition under mercy of aliens or taking having alien gene as excuse and making oneself ready to serve autocrats that commit genocide is nothing but cowardly. These days it is observed when a theory that says those that are of mixed blood could get proper place only in unitary empire state. Oromo have a country and that is Oromiyaa. If they are born from any of the Oromo parents they belong to Oromiyaa unless they disclaim and opt for another country. All peoples have laws and traditions by which to trace genealogyand that of Oromo hybrids will not be different. There is no third alternative but to join one’s father or one’s mother or be cosmopolitan and fit anywhere without prejudice. Oromo are not those of the past whom they used to load and drive but those which are out to reclaim their lost freedom and dignity. Itmay befrightening to be a member of the oppressed group for it has more deaths, humiliations and sufferings. But freedom doesn’t come without a cost. Now, things are changing since Oromo started to assert themselves. The Habasha want to continue approaching them with colonial symbols and Ethiopianism; they are still mentally colonizers despite changes inother relations. There is a long way left for them to understand the Oromo question that is why they are pushing forward the hybrid question. We learned lots from imprisonment and the killings of our hero brothers on October 18, for whom ethnicity was never a question in fighting for Oromo freedom. Habashaa bureaucrats did not even consider if a fly was killed from among us. The colonel and his group thought they would be safe by implementing orders for eliminating individuals. They had come doing that for over fifteen years. At the end they saw that their actions only made fast their demise. They prepared a smooth ground for their nemesis. A harsher more vengeful and tactful opponent destroyed their power and perfected their system. It didn’t do to them what they were doing to others. They did not kill them but gave them the chance to defend themselves before a court of law, be it kangaroo or genuine which they denied others. Their objective is the same; their quarrel is for power, it was not their business to correct injustice done by Darg as people expected. As long as they can subjugate the colonies they are not bothered correcting Darg’s follies. The new rulers were not betterthan Dargbut the new patrons wanted them toat least pretend to be law abiding and democratic. Yet, they are using all available means, kidnaping, summary killings, imprisoning, torturing and eugenics to suppress Oromo freedom and liberty and for ethnic cleansing very diligently. That have added more fuel to the struggle that those martyrs ignited for independence of the fatherland. Many including the colonel died in prison for lack of comfort and treatment. The one that replaced them has perfected Darg’s instrument of suppression and is moving in the way they showed it. Histories of Habashaa oppressors show that there will always come a time, when the oppressor takes the place of oppressed and experience not only all its brutalities but also all its sufferings. No one ever escaped that wrath. After the massacre life continued as usual waiting for come what may. Release came for most three years after the massacre and 5 years for others. For this writer all are his younger brothers and comrades. They have gone through prison life together, which included corporal and mental torture. They have lived with him for six years hosting torture victims all through those years. Agony of Oromo political prisoners behind the bars are more than one could tell. They have all eaten leftover of palace guards,“zilzil”, leftovers that included chewed and spat cartilages supposed to be thrown out as garbage but sent to be recycled in prison cells carried on barilla carrying concrete for building s called “barilla”. Together they have shared the good in the bad. When this writer thinks of them tears, nervousness, old pains from tortured body parts start to come back. For this reason he tries to avoid their memory to keep him sane. But how can it be possible if not self-deceit? It is now 30 years since they parted, those comrades that survived them are still living by accident. Only free people die by accident. Most still have kept their promise to uphold the national Kaayyoo and fly their bannerhigh. Rest in peace comrades! You have taught us love, courage and patriotism. With your blood millions of patriots have blossomed.